Grave of Simon Kenton, spy, frontiersman, and militia commander. 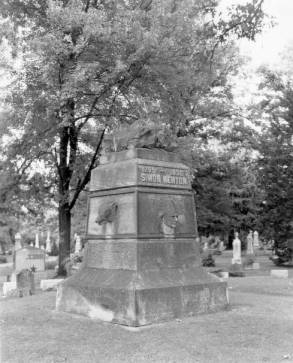 The grave and monument is in Urbana, Champaign County, Ohio. The photograph was taken ca. 1940-1949. Simon Kenton was a legendary frontiersman in Ohio and the Midwest. He was born on April 3, 1755, in Fauquier County, Virginia. He grew up helping his father on the family farm and therefore had little opportunity to go to school. At the age of sixteen, Kenton became involved in a fight involving a woman. Believing he had killed a man, he fled to the Ohio Country where he changed his name to Simon Butler. Kenton spent the next two years hunting along the Ohio River. In 1774, he served as a scout during Lord Dunmore's War. By 1775, Kenton had moved to Boonesborough, Kentucky. For the next few years, he worked as a scout for the settlement, often coming in contact with the local American Indians. At one point, Kenton is said to have saved the life of Daniel Boone. During the American Revolution, Kenton participated in a number of military engagements against the British and their American Indian allies. In 1778, he joined George Rogers Clark on a difficult but successful expedition into the Illinois Country to attack British outposts as well as American Indian settlements. Returning home, he accompanied Daniel Boone in an attack on the Shawnees's settlement of Chillicothe near what is now Oldtown, Ohio. That same year, Kenton was captured by American Indians, who tortured him and attempted to burn him at the stake. Simon Girty rescued him and instead of his being killed, Kenton was sent to Fort Detroit as part of a prisoner trade with the British. By mid-1779, Kenton was free and had returned to service under George Rogers Clark. In 1782, he discovered that the man that he thought he had killed had actually lived. Therefore, he was able to resume his own name once again.